A few years ago, I wrote an article on Chinese depressive and atmospheric black metal specifically centered around the label Pest Productions. The label had a treasure trove of wonderful bands from China and also surrounding areas. 葬尸湖 (Zuriaake), 黎明的幻象 (The Illusion of Dawn) , Культура Курения (Smoking Culture), 阴暗之泉 (Dark Fount), and 墓 (Tomb) were some of the bands that came with gloomy album covers with characters scrawled on the front. China, and also Pest Productions has grown in recent months specifically with the weird identity mixup related to US black metal act Ghost Bath. 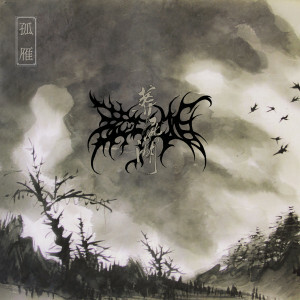 Whatever intentions and misconceptions are related to Ghost Bath and its creators is moot as China is still an interesting place for horrid sounding black metal. If you are new to Chinese black metal, why not start with a release that you probably can not ever get. 孤雁 (Gu Yan) sounds at home in 2015 compared to Zuriaake’s earlier efforts. 2007’s 弈秋 (Afterimage of Autumn) and 2012’s 冬霾 (Winter Mirage) were more based in lo fi atmosphere and abrasive atmosphere characteristic of DSBM. Gu Yan is cleaner and more melodic despite the second track “天庭 (Heaven)” having throaty rasps for its vocals. Gu Yan fits in with recent developments in black metal as the some of the style pushes towards melodic atmospheres and post rock leanings. Despite the use of piano and clean vocals, Gu Yan is still alienating and harsh in a way that takes its listener and places them alone surrounding by misery and decay. This rot however is not intrusive and feels wonderfully inviting. Gu Yan, in physical print, was made specifically as an incentive for fans to buy merch from Pest Productions. The two song 19 minute release is the first for Zuriaake since Winter Mirage. Zuriaake takes their time in making music but when it is released, it comes with feverish excitement is for nothing else than the years since the last record. Perhaps Gu Yan is a harbinger of a new album. If nothing else take solace in the fact that you can get the digital version of the record for 5 dollars if you were not one of the 200 (100 Chinese/100 overseas) people who got the physical copy. Enjoy yourself while the world crumbles in sorrow.